Admission on M.Ed. IER Dhaka University has been published. M.Ed. IER (The Institute of Education and Research-IER) Dhaka University currently invites an application.The Institute of Education and Research (IER) of Dhaka University invites application from the interested candidate for the 2nd batches semester of two years evening course for the education year-2014-2015. Admission on M.Ed. IER Dhaka University invities application from the eligible candidate. M.Ed. IER (The Institute of Education and Research-IER) of Dhaka University invites application from the eligible interested candidate for the 2nd batches of two years evening course for the education year-2014-2015. M.Ed. IER application Form will be collect from Sonali Bank of Register Building of Dhaka University of all working days within specific time with a deposit of TK 1,000(One Thousand) from 18 October 2015 to Thursday 26 November 2015 within 5.p.m. (instead of Thursday 19 November 2015). Filling Application must be deposited to Room No: 105 of the institute up to 5 p.m. on Thursday 26 November 2015 within 5.p.m. (instead of Thursday 19 November 2015). M.Ed. 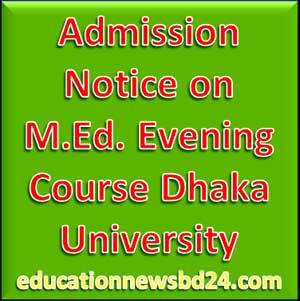 IER Evening Course Admission test of Dhaka University starting from 18 October 2015 and end on Thursday 26 November 2015 within 5.p.m. (instead of Thursday 19 November 2015). Admission Test exam will be held on Friday 27 November 2015 (instead of Saturday 21 November 2015) at 10: A.M of IER building. The process of the exam is MCQ and time sanction for an hour. (1 Hour). Application End Date: Thursday 26 November 2015 (instead of Thursday 19 November 2015). M.Ed. IER Admission Test Exam Date: Friday 27 November 2015 (instead of Saturday 21 November 2015). Date & Time of Exam: Friday 27 November 2015 at 10:00 A.M (instead of Saturday 21 November 2015). Allocated Time for M.Ed. Exam: for an hour. (1 Hour or 60 Minutes).